Copyright © Bill Dameron - This image is copyrighted. Unauthorized reproduction prohibited. 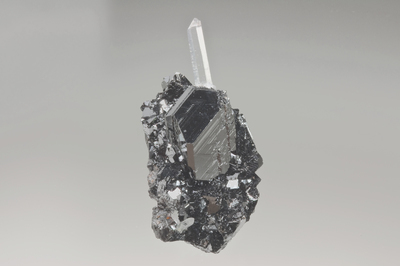 Lustrous twin sphalerite 2.4 x 2 cm, on smaller sphalerite crystals, with one very clear 2 cm quartz needle behind it, a few smaller quartz crystals. 6x3.5x3 cm overall.